Hi all, new member here seeking some advice on a sailboat. I live alongside a river that is roughly 15km upstream from the coast. About fifteen years ago I built an 11’ alloy flat bottomed boat, powered by a 10hp Mercury outboard. This has been used for hunting, fishing & duck shooting trips, as well as salvaging firewood as storms dislodge trees further upstream. It has been a really useful utility craft, even though she’s no beauty! I also have a locally made 10’ clinker built row boat, that I have used for shorter trips and lazing about on warm summer evenings. I have been thinking for a couple of years now about getting something bigger; something that will replace the alloy boat. I am thinking of something with a cabin suitable for extended overnight stays (or longer) and something that would cope beyond the river and handle runs along the coast. I have sailed as a boy with my father, but I was very young, so I am basically starting from scratch in that regard. He had a wee GRP dingy and a Westerly Jouster. I like the look of the ‘Folkboats’, so I am thinking of something along those lines, with an alloy mast and an inboard diesel engine. I like the inboard arrangement as it is all contained as one unit, ready to go when needed and it doesn’t detracted from the clean lines externally. I realise the inboard/outboard debate can be polarizing, but I have had enough of lugging an outboard around. I am looking for an existing boat; I am not looking to build one from scratch. Although getting something that needs some work doing on it would be okay. I am content to confine myself to the river (for a couple of years need be) while I get experience, however there are a couple of issues that will govern my options. Firstly road bridges, of which there are two downstream from me. The first is quite close from home and the second is just in from the river mouth.So I need a boat that I can easily lower the mast on and then raise it again single handed while on the water. Is this asking too much for a boat the size of a‘Folkboat’? Am I being unrealistic for a beginner? The second issue is, afterthe second bridge there is a bar at the mouth. There is ample calm water between the second bridge and the bar to hoist the mast and prepare, before motoring out over the bar though. There are lakes nearby also, but they are land locked. So I would have to have a trailer if I wanted to sail in them. Given a choice I would rather have a boat that was safer in coastal waters and not access the lakes. Rather than get something smaller, lighter that could be towed to the lakes, at a compromise to sea worthiness along the coast. I’d appreciate some thoughts and advice if this sounds feasible for a beginner. Is the bridge issue a common problem for others too? Apologies if I don’t respond for a few days, as I have to use town internet, when I can get there. Welcome to the forum FF afloat. You have a broad range of criteria for your boat. I owned a folkboat for a while and had to drop the mast every time I went to sea. Doable, but not a trivial job. Given a choice I would look at boats with a mast short enough to clear the bridges. What is the minimum clearance you're dealing with? Trailering any boat is possible, it really just depends on the trailer, tow vehicle, and a decent boat ramp. I wouldn't want to do it with a folkboat just because the trailer would end up costing as much as the boat and the tow vehicle would be big and heavy. But, if money isn't an issue it should be possible to work out a manageable set up. Welcome aboard, FF Afloat! A clue as to your home waters might help, too. You may find members nearby who have experience with exactly what you need to cope with There are river bars and there are river bars...some fairly easy to deal with, some....not so much. You've given us a lot of good information -- bravo! But I think we'll need more to give any accurate advice. 1. Clearance height of bridges at high tide? 2. Depth of river areas where you'll be sailing? Will you be sailing from dock to dock, or beaching it to land? 3. Location of sailing areas? This matters due to tides, currents and wave forms, which vary widely in different parts of the world. Overall without knowing much, I'd say you'll want to look at the type of boats used in the Broads in the UK. They're shallow draft designs with an easily-operated counter-balanced tabernacle to get under the many low bridges. Last edited by Thorne; 04-11-2019 at 11:31 AM. I understand your interest in having an inboard diesel engine in your boat. To my knowledge only a very few Folk Boats were fitted with inboards and I belive that was in a boat of modified design. What you are facing is having a hull large enough to accommodate and inboard so far as weight is concerned. This means that you are facing a boat that, ideally, would be between twenty five to twenty eight feet in length. Yanmar makes a ten HP. engine and Bukh makes a very reliable small engine as well. If an inboard is your forte then seek out the lightest and most reliable engine you can and then choose a design that will accomodate it. Wishing you good fortune with your dream boat! I think a nice Cat Boat (wood or frozen snot) might be a good choice. They are shallow draft and you can lift the centerboard when you run aground. A modest inboard would be no problem. More info, please. Is this boat for solo use, or does it need to overnight two or more? Also, are there strong currents in the river? Budget constraints? That's a tall order to have a shallow draft boat with a tabernacle that is also an awesome offshore boat. Usually a good offshore boat has a deep draft and a fully stepped mast. I'm not saying that it doesn't exist, but here may be a need to make a few compromises somewhere. Hi, Thank you for all the useful responses and sorry for omitting some vital details in my first post. I’ll add some more info based on your questions. Whilst towing capacity and building a trailer isn’t really an issue, I probably don’t want to be mucking around with a big trailer, but I guess it depends on what I find for sale, so not ruled out at this stage. Location is New Zealand, I probably should have mentioned that sooner. I have no experience with bars, but know enough to be super cautious. I good friend, is out there every weekend and knows it well. But I wouldn’t be attempting it until I had studied a few boats crossing it, talked to the local fishermen and crossed it with somebody else first so I know what to expect. I also need to find out some depths for high/low tide for it too. As I say, I’m happy to confine myself to the river until I have gained some experience. I have a small jetty outside my place and I can extend it if required, but I think it should be okay. I can also sink some deeper timber piles to tie up to if needed, by using the bucket of an excavator/digger to push them down into the bank. I doubt I would need to beach it to land anywhere, as the banks are pretty good and I can just tie up alongside. The river by me is still tidal and it can vary a lot. I took a measure at low tide and I have 6’ of water about 3’ off my jetty and about 12’ of water in the centre of the channel. The rivers flow is not fast flowing under normal conditions and on the odd times it is really running, I don’t go out anyway. I would normally pull my alloy boat out when it is really running, but with a larger boat, I’d just have to put extra lines to it to ensure it doesn’t break free. I know an inboard diesel obviously takes up valuable space, but I can accept that, knowing I can just turn a key when required without mucking around. All my vehicles are diesel, so I always have good stocks stored on site and it has a good ‘shelf life’ compared to petrol, so adding another diesel to the fleet is an easy decision on a broader practicality front. “Frozen Snot” Haa, I liked that! I checked out the Mastender link; I think I’d feel more comfortable taking a few minutes longer to raise the mast, than add a hinge into the mast. Seems like it’d be something else for me to worry about. As for budget, money is always an issue, but we always seem to find a way! I just don’t know enough yet to commit to a number. Something that floats would be an advantage, something that needs some tidying up is okay. I’m not building from scratch and I’m not buying new. I just need to look at sites like this and see what’s available locally to get a feel for things. The last few weeks have been pretty hectic, but I hope to be able to get out and visit some yards/marinas and see what’s around. It’s the start of a big learning curve and I know I don’t know half of what I’m looking at yet. Finally, I’m going to be mainly doing this single handed with a hound, maybe overnight accommodation for two up at most. I can be a miserable bugger at times; I can’t imagine many would want to be stuck in a small boat with me for long! Based on what you've said, there is plenty of water to float a folkboat (4' draft) and lowering the mast to get under low bridges can be done (but isn't trivial like on a small trailer sailer). I'm wondering about your planned use. If seaworthiness is important the folkboat is a good choice. If you plan to stay on the river or coastal waters where sheltered anchorages are readily accessible, a smaller boat may be a lot less work to go sailing. Really depends on what you want out of your boat. 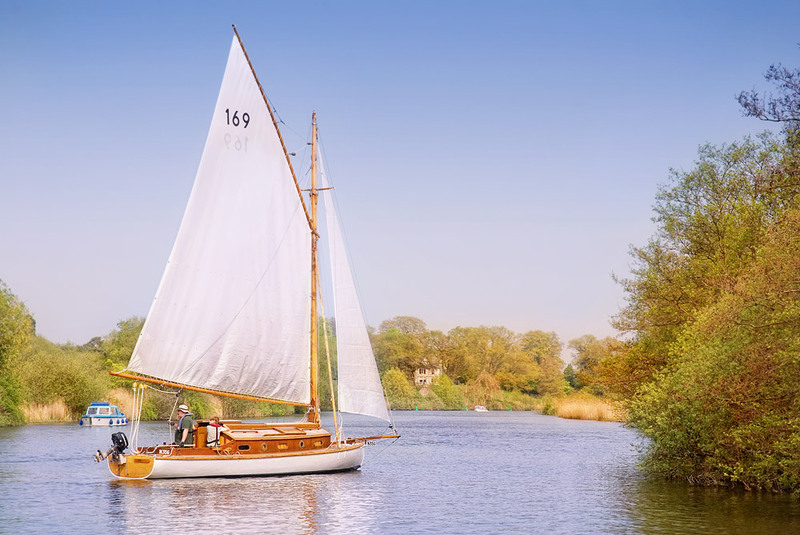 I've never heard of anyone sailing folkboats anywhere in tidal rivers -- they all seem to be sailed in deeper waters like bays or lakes with docks / quays. As above the boats for river boating under low bridges are quite different from those used offshore, and I don't think there is a single design that can safely "do it all". I raise the mast on my 20' boat in a similar fashion, no A-frame but with a tackle forward to the bowsprit. It's one thing on a trailer, another afloat with the boat rolling around. A gaff rig generally has a shorter mast than a marconi, nominally easier to get up and down. An unstayed balance or standing lug like on a Sooty Tern or Caledonia Yawl would make getting under those bridges very easy. Those are open boats but they have proven seaworthy and quite tentable.